Read more "Puppy Bowl XIV: The Real Championship on February"
Read more "To Eat or Not To Eat: Tide Pods"
Read more "The Second Biggest Selfie on Twitter"
Read more "NHsmc Sysomos: Serena Sarch, Meghan Flynn, Jacqueline Fulcher, Kat Brady"
Read more "Kylie Jenner and the Announcement of Baby Stormi"
Read more "#Stormi Makes it Rain"
Read more "The #SuperBowl of Twitter"
By using the Sysomos Analytics Platform, we created a Boolean Search analyzing the controversy surrounding “Lady Doritos.” Following a Doritos commercial aired during the Super Bowl, consumers reacted negatively to a comment made by PepsiCO CEO, Indra Nooyi in a “Freakonomics Radio” podcast interview. “As you watch a lot of the young guys eat the chips… they love their Doritos, and they lick their fingers with great glee … Women, I think, would love to do the same, but they don’t. They don’t like to crunch too loudly in public.” The Twitter widgets: latest activity, geography, word cloud and buzzgraph, were used to analyze the search term “lady dorito” OR “#ladydorito.” The latest activity graph for the range of 2/1/18- 2/8/18 showed a clear spike on the day after the Super Bowl, Monday February 5th, and subsided on Wednesday, February 8th. @CarolineSiede created a thread defending Nooyi’s comments, which became most retweeted tweet for this topic. 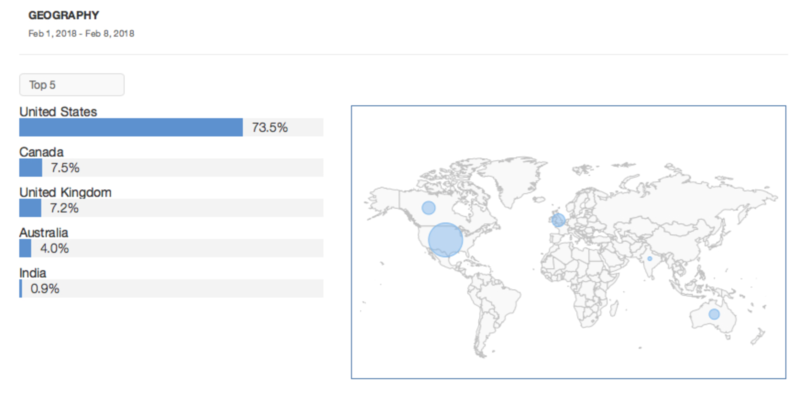 The geography filter showed how this topic trended globally; the majority of the Twitter conversation occurred in the United States with 73.5%, followed by Canada and the United Kingdom. 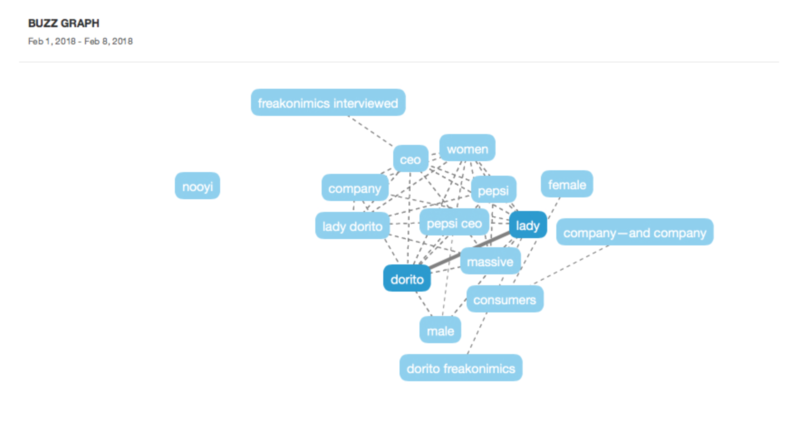 We inferred connections between words within the buzzgraph to better understand the controversy of Nooyi’s comment.Since our Boolean search used the two words “lady dorito” they appeared in the center of the graph, with related words surrounding them. The buzz graph showed the term ‘freakonomics interviewed’ outside of the graph indicating the main cluster of words were all words discussed in podcast interview mentioned. The Sysomos system allowed us to clearly define the root of this controversy and see the way that consumers reacted. Read more "The Lady Dorito Controversy"
The 2018 Winter Olympics began February 9. Naturally, Twitter was buzzing the week before with pre-Olympic chatter. By searching the following Boolean in Sysomos, a social listening tool, we were able to find out what exactly the Twitter world was excited about approaching this year’s games. Boolean: “(#olympics2018 OR #winterolympics) AND NOT @NBCOlympics”. Our Wordcloud, which maps the most reoccurring words, showed the location of the games was a frequently discussed topic. The only specific athlete that showed up was figure skater Adam Rippon, however, through further analysis, we discovered this was due to the social buzz around an ongoing feud with US Vice President Mike Pence, who’s name is also prevalent through the cloud. When looking at the latest activity, #TEAMUSA took over the mentions. This is because of retweeted posts from top athletes. The geography analysis proves the reason the majority of Tweets referred to the US was because a whopping 66.8% of the Tweets came from the US. 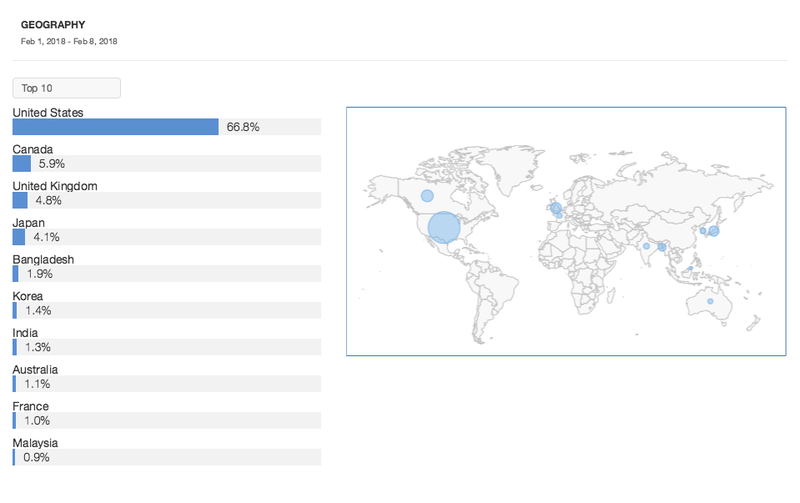 Despite corespondents already in South Korea, not many Tweets came from the host country itself. The most retweeted Tweet was politically based, summarizing the interaction between Rippon, the first openly gay figure skater, and Pence. This shows that even within an event that is supposed to unite our country in celebration, politics still stands as a divider.
.@mike_pence: I’d like to meet with US Figure Skater Adam Rippon. @Adaripp: No thanks. Mike Pence doesn’t stand for anything that I believe in. 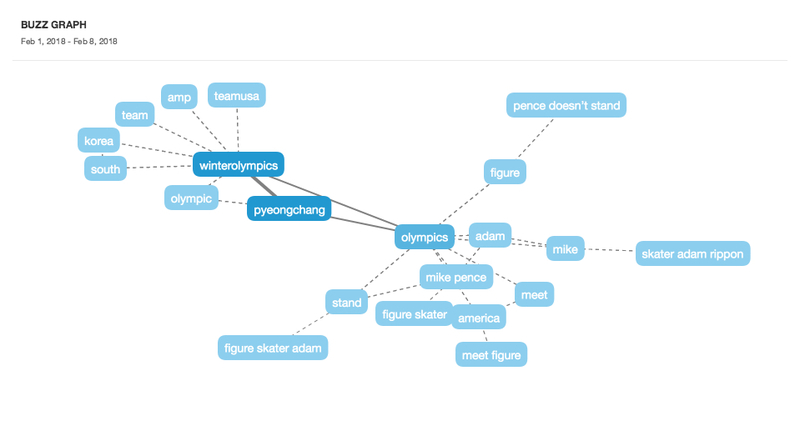 Finally, our Buzz Graph, which shows the linkage between different topics in the Tweets, confirms that the Olympics were being discussed primarily in the context of their host country or in relation to the ongoing Rippon-Pence drama. In conclusion, the pre-Winter Olympic chatter, was focused less on the athletes’ abilities and more on the controversies surrounding the location or social positions of athletes, demonstrating today’s politically focused environment has impacted even the oldest of traditions. Read more "The Politics of the Pre-Olympic Hype"